in Kariba. We used to share a lot during those days as I was also based at Nyanhewe Primary School which by then was the best resourced school under the Municipality of Kariba. I remember in 2001 when his grade 7 class at Nyamhunga Primary School was the best hitting a 100% mark whilst my class at Nyanhewe was standing at 96 %. We spoke about our results then because I had believed I was the best but alas he had the 4 steps ahead. Teaching was just a true profession that required passion, dedication, determination and devotion where we would just teach right into the evenings without anything called paid extra lesions. We were working for our egos, our pride, our nation, our people and our life. He then moved to this former group A primary school in Kariba known as Heights Primary of course due to being one of the few best teachers of that time. We became closer and he would tell me that I was the next teacher to follow him to Heights Primary and indeed in 2003 the Ministry then requested I move to Heights Primary. Abel, my Tezvara was my neighbour, a colleague, a friend whom we could share all issues around how we could improve our profession and of courses our financial status. The splendour of it was that we all had Diplomas in Education, Diplomas in Personnel Management and I already had my first degree whilst he was pursuing his. An opportunity came through his brother for him to run Twin River. I remember we reasoned at length, weighed the pros and cons of getting into the hoteling industry and leaving the biggest employer (government). Abel was calculative and would want to always go through something to be 100% whilst I would just leave the other 4% hence I told him point blank that it was time for him to venture and be able to drive. Age was no longer on his side as he was born on the 3rd of March 1971 giving him a five year difference to leave me teaching. We thank the Almighty that he accepted to go back where he started his life in Karoi, where he had done his primary education at Chikangwe Primary before moving to Kariba for secondary education at Nyamhunga High. He left for Karoi and the next thing was Abel Matsika in a brand new BMW that shocked but motivated many making me also see more possibilities in life and believed the sky was the limit. Twin River hotel did great and things changed, Abel graduated with a BSc honours in Psychology and I am sure he should be pursuing an MBA with UZ. I got to realise that he then became a director at Twin River hotel the time he came to Kariba for a Lions International Club function and convincing me that it was good to be a Lion and work for the community doing community development especially charity work. He spoke of his venturing into farming managing great harvests in tobacco. What I took as a joke in 2012 was when he said "Mukuwasha I am going to contest as a councillor ward 7 Karoi urban", worse a ZANUPF Councillor. He won and ran a term as Chairperson of the Finance and Investment committee but I asked him why he was not the Mayor. He was not enthusiastic to converse on that as he had never been a ravenousness person but a 100% calculative person who accepted that Cde Ziki would be the best for the office then. This 2018, he said, "Mukuwasha pray for me and campaign for me in whatever way you can because I would be contesting for the second term so that I finish whatever started". Honestly with the amount of heat that was coming from the MDC Alliance I said, "Tezvara why risking?" His response was that he would sail through and his colleagues would even give him more and challenging responsibilities. Only yesterday he communicated by way of sending me photos without any caption and I thought he had graduated when I saw the gown. 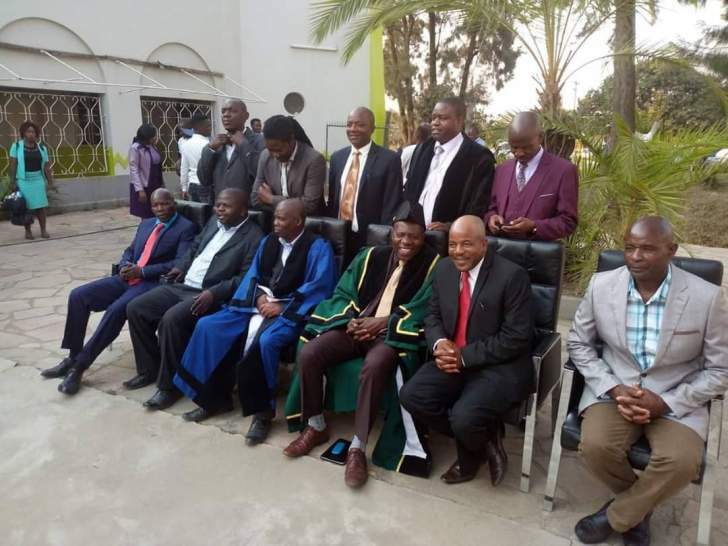 Had it not been for my wife, his sister who laughed and said, "Aaaaa, Abel is now the Mayor of Karoi", I would have congratulated him on finishing his MBA at UZ. I would tell the Karoi residents that Abel is a 100% cadre whom if utilised well, great things await them and truly the farming town will be the hub of Mash West. I am in no doubt he is the patron of Karoi United FC and if the soccer fans work well, we can see another premier team imaging in Mash West, a distant from Katuruturu keKariba. Let him remain the chairman of the Hurungwe Children's home since charity work is already in his blood. Ambuya vangu Susan and the 3 children they have stand supportive for him to go far and further. Well done Karoi. All the best to teacher, hotelier, farmer, leader, chairman and Lion Abel Matsika.